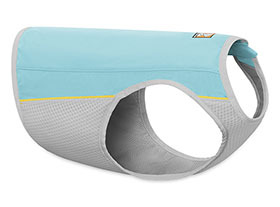 The Ruffwear Jet Stream efficiently cools dogs during light and fast, high-intensity activities through shading and evaporative cooling. 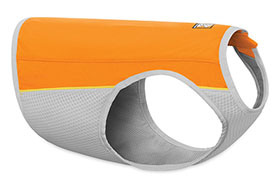 The light and sleek Jet Stream uses shade-providing spandex over the back, while Ruffwear’s three-layer evaporative cooling chest panel disperses heat from the dog’s core. To activate the Jet Stream, soak in water, wring out, zip on your dog, and go. Easy. Keep your dog safe!